Authors: Mueller, R.D., L. Padman, M.S. Dinniman, S.Y. Erofeeva, H.A. Fricker, M.A. King. 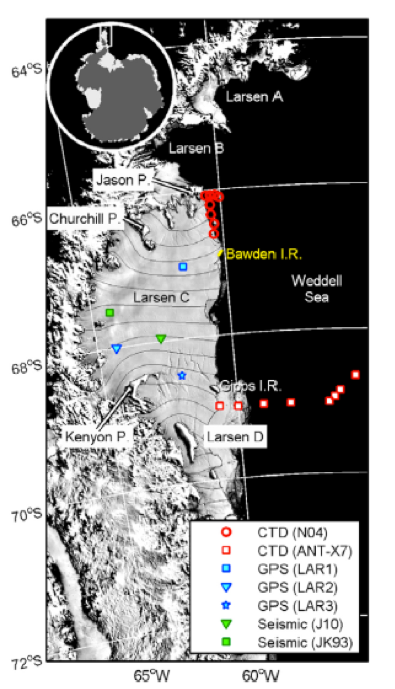 Title: Impact of tide-topography interactions on basal melting of Larsen C Ice Shelf, Antarctica. Basal melting of ice shelves around Antarctica contributes to formation of Antarctic Bottom Water and can affect global sea level by altering the offshore flow of grounded ice streams and glaciers. Tides influence ice shelf basal melt rate (wb) by contributing to ocean mixing and mean circulation as well as thermohaline exchanges with the ice shelf. We use a three‐dimensional ocean model, thermodynamically coupled to a nonevolving ice shelf, to investigate the relationship between topography, tides, and wb for Larsen C Ice Shelf (LCIS) in the northwestern Weddell Sea, Antarctica. Using our best estimates of ice shelf thickness and seabed topography, we find that the largest modeled LCIS melt rates occur in the northeast, where our model predicts strong diurnal tidal currents (∼0.4 m s−1). This distribution is significantly different from models with no tidal forcing, which predict largest melt rates along the deep grounding lines. We compare several model runs to explore melt rate sensitivity to geometry, initial ocean potential temperature (θ0), thermodynamic parameterizations of heat and freshwater ice‐ocean exchange, and tidal forcing. The resulting range of LCIS‐averaged wb is ∼0.11–0.44 m a−1. The spatial distribution of wb is very sensitive to model geometry and thermodynamic parameterization while the overall magnitude of wb is influenced by θ0. These sensitivities in wb predictions reinforce a need for high‐resolution maps of ice draft and sub‐ice‐shelf seabed topography together with ocean temperature measurements at the ice shelf front to improve representation of ice shelves in coupled climate system models.